DNA and proteins show unique stereochemistry with a variety of biochemical functions. Quite interesting structures can be formed, among them catenanes and knots. Molecular topology is a field in chemistry that deals with mechanically interlocked architectures. Examples are catenanes, rotaxanes, molecular knots, Möbius strips, and Borromean rings. 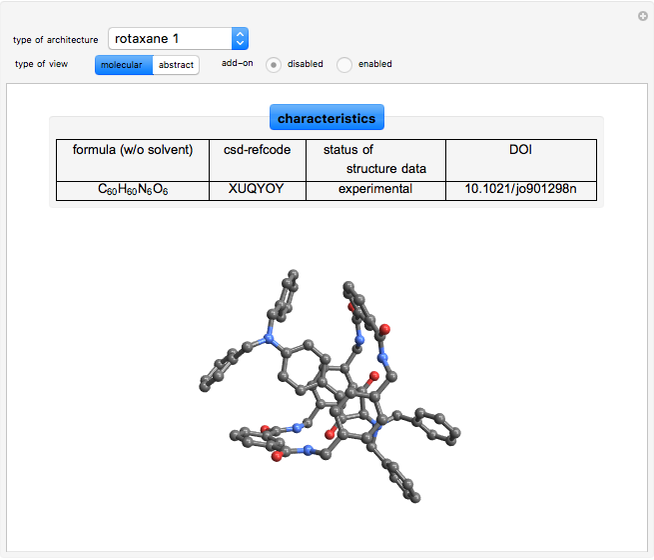 This Demonstration shows the basic characteristics for a chosen set of nine molecules: the formula (without solvent), the csd-refcode, the status of crystal data (experimental, calculated or modeled or both), the DOI (digital object identifier for a publication), and a molecular and abstract view, each in 3D. For Möbius strips and Borromean rings, showing add-ons is available as an option via a checkbox. 1. A catenane is a mechanically interlocked assembly with two or more macrocycles. 2. 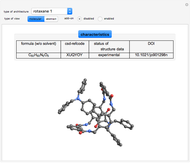 Rotaxanes contain a linear component (shaped like a dumbbell) threaded through a macrocycle. 3. 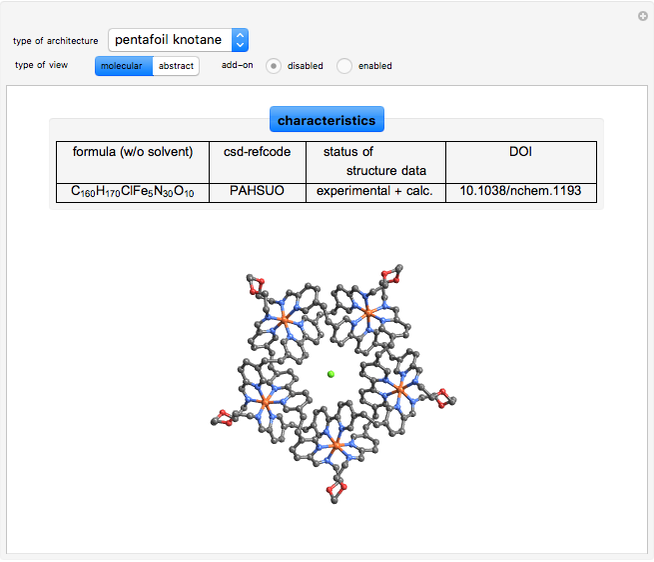 Knotanes are topological isomers of macrocycles that are analogous to macroscopic knots. 4. A Möbius strip is a ribbon closed with a twist. Since 2003, several aromatic molecules with -electrons and Möbius topology have been made. 5. Borromean rings contain three intertwined macrocycles. If you remove any of the three macrocyles, the other two are not linked. The Ru(terpy-biphencatenane) and the organogold(I)catenane can be visualized topologically with two interlocked rings [4, 5]. In the truncated squaraine rotaxane the ring structure looks like a boat. A pseudorotaxane was formed by dialkyl-viologens and dibenzo-24-crown-8. It contains two macrocycles. Rotaxanes can be visualized topologically with a stick formed like a dumbbell threaded through one or more rings [6, 7]. The organic ligand 7-((13-(quinolin-6-yloxy)-3,5,8,11-tetraoxatridecyl)oxy)quinoline, named 5 in , can form a trefoil knotane . An assembly of five bis-aldehyde and five bis-amine building blocks around a chloride anion was used to synthesize a pentafoil knotane . These compounds can be visualized topologically with the trefoil and the Solomon's seal knot. Both hexapyrins contain a structure with Möbius topology. To visualize it approximately, enable the add-on. The red part of the strip is a signal for the twist. The abstract view of the Möbius strip delivers a one-sided surface [10, 11]. The chiral borromeate contains three rings. To visualize it, enable the add-on. Borromean rings are the simplest example for a Brunnian link . experimental, calculated/modeled, and experimental + calc. factors can be used to describe the quality of the crystal data, but should be handled with care . The ball and stick figures are derived from crystal structures found via CSD. The CCDC refcodes for each structure used are listed in the Demonstration. J-P. Sauvage and C. Dietrich-Buchecker, Molecular Catenanes, Rotaxanes, and Knots: A Journey through the World of Molecular Topology, New York: Wiley-VCH, 1999. C. Wolf, Dynamic Stereochemistry of Chiral Compounds, Cambridge, UK: Royal Society of Chemistry, 2008. E. V. Anslyn and D. A. Dougherty, Modern Physical Organic Chemistry, Sausalito, CA: University Science Books, 2006. J. Loren, P. Gantzel, A. Linden, and J. Siegel, "Synthesis of Achiral and Racemic Catenanes Based on Terpyridine and a Directionalized Terpyridine Mimic, Pyridyl-phenanthroline," Organic & Biomolecular Chemistry, 3(17), 2005 pp. 3105–3116. doi:10.1039/B506101F. C. McArdle, S. Van, M. Jennings, and R. Puddephatt, "Gold(I) Macrocycles and Topologically Chiral Catenanes," Journal of the American Chemical Society, 124(15), 2002 pp. 3959–3956. doi:10.1021/ja012006+. N. Fu, J. Baumes, E. Arunkumar, B. Noll, and B. Smith, "Squaraine Rotaxanes with Boat Conformation Macrocycles," The Journal of Organic Chemistry, 74(17), 2009 pp. 6462–6468. doi:10.1021/jo901298n. K. Nikitin and H. Müller-Bunz, "Encapsulation of 4,4´-bipyridinium Cations by Two Crown Ether Molecules: Formation and Structure of pseudorotaxanes," New Journal of Chemistry, 33, 2009 pp. 2472–2478. doi:10.1039/B9NJ00414A. J. Bulier, A. Jouaiti, N. Kyritsakas-Gruber, L. Allouche, J-M. Planeix, and M. Hosseini, "Direct Synthesis and Structural Characterisation of Tri- and Tetra-nuclear Silver Metallaknotanes by Self-Assembly Approach," Chemical Communications, 46, 2008 pp. 6191–6193. doi:10.1039/B815580A. J-F. Ayme, J. Beves, D. Leigh, R. McBurney, K. Rissanen, and D. Schultz, "A Synthetic Molecular Pentafoil Knot," Nature Chemistry, 4, 2012 pp. 15–20. doi:10.1038/nchem.1193. S. Tokuji, J-Y. Shin, K. Kim, J. Lim, K. Youfu, S. Saito, D. Kim, and A. Osuka, "Facile Formation of a Benzopyrane-Fused Hexaphyrin that Exhibits Distinct Möbius Aromaticity," Journal of the American Chemical Society, 131(21), 2009 pp. 7240–7241. doi:10.1021/ja902836x. J. Sankar, S. Mori, S. Saito, H. Rath, M. Suzuki, Y. Inokuma, H. Shinokubo, K. Kim, Z. Yoon, J-Y. Shin, J. Lim, Y. Matsuzaki, O. Matsushita, A. Muranaka, N. Kobayashi, D. Kim, and A. Osuka, "Unambiguous Identification of Möbius Aromaticity for meso-Aryl-Substituted Hexaphyrins(1.1.1.1.1.1)," Journal of the American Chemical Society, 130(41), 2008 pp. 13568–13579. doi:10.1021/ja801983d. R. Herges, "Topology in Chemistry: Designing Möbius Molecules," Chemical Reviews, 106(12), 2006 pp. 4820–4842. doi:10.1021/cr0505425. C. Pentecost, A. Peters, K. Chichak, G. Cave, S. Cantrill, and J. Stoddart, "Chiral Borromeates," Angewandte Chemie, 118(25), 2006 pp. 4205–4210. doi:10.1002/ange.200600817. International Union of Crystallography. 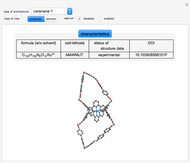 "Online Dictionary Of Crystallography: R Factor." (Apr 4, 2008) reference.iucr.org/dictionary/R_factor. Guenther Gsaller "Topologically Interesting Molecules"